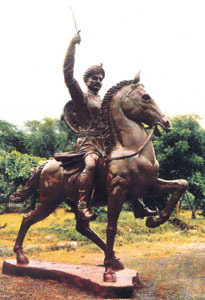 Rao Tula Ram was one of the prominent leaders of the Indian Uprising of 1857 against the colonial British forces. His story is one of rebellion and guerrilla warfare against the stronger and better-equipped imperialist forces of the British Army. He was born on 9 December 1825 in the well known Rao family in village Rampura in the district of Rewari (a two-hour drive south-west of Delhi), in what is now Haryana. His father was Puran and his mother’s name was Gyan. He was educated according to the then prevalent customs and he knew Persian, Urdu, Hindi and a small amount of English. In November 1839, Rao Tula Ram ascended the throne on the death of his father. In 1857, on hearing the news of rebellion at Meerut and other places, the people of the Rewari rose up to support the uprising. In the Rewari area, lead was given by Rao Tula Ram. His cousin Gopal Dev also stood by him. The forefathers of the Raos had helped the Marathas in 1803 in the Second Anglo-Maratha War. The British confiscated their land and gave instead an ‘istamarari’, or grant, of about 58 villages. This was a great blow to the Raos, who were itching to fight the British Raj at the first available opportunity. On l7 May 1857, Rao Tula Ram went to the ‘tehsil’, or headquarters, at Rewari with four to five hundred followers and took all the government buildings in their possession. For their headquarters, they chose Rampura, a small fortified village, one mile south-west of Rewari. Tula Ram, the elder Rao became Raja and Gopal Dev his commander-in-chief. After assuming charge, Rao Tula Ram organized the revenue department and collected revenue and taxes. He took donations and loans from the people of Rewari. He raised a force (about five thousand men) and set up a large workshop in the fort of Rampura where a substantial number of guns, gun-carriages and and ammunition were manufactured. Law and order was enforced. At this time, Delhi was under attack from the British forces, so Rao Tula Ram helped the emperor Bahadur Shah in their fight against the British. But this help could not protect Delhi which fell to the British on September 20, 1857. Soon after Brigadier-General Showers led out a column (from Delhi) of 1,500 men with a light field battery, 18 two-pounder guns and two small mortars, “to attack and destroy Rao Tula Ram and his followers and to raze his fort (at Rewari).” The situation was serious and the Rao foresaw that a fight with the British forces in the mud fort of Rampura, in the changed circumstances after the fall of Delhi, would result in the complete destruction of his army without any serious loss to the British. So he left his fort before Showers’ arrival. The fort of Rewari was taken by the British without any opposition on October 6th. Immediately after the occupation of Rewari, Brigadier-General Showers sent a messenger to Tula Ram telling him that if he submitted along with guns and arms, he would be treated on merits. But Tula Ram turned down the inducement and sent a strong column comprising about 1,500 troops under Colonel Gerrard, an officer of conspicuous merit on November 10, 1857. The column reached Rewari three days later. They occupied the abandoned fort of Rampura. Here they were joined by two squadrons of the Carabineers. After a few days rest at Rewari (Rampura), on November 16, Gerrard marched to Narnaul. As the track was sandy, the column reached Nasibpur, a small village, two miles northwest of Narnaul and halted for a short rest. The rebel force, having abandoned their strong fort in the center of the town pounced on them. Rao Tula Ram’s first charge was irresistible and the British forces scattered before them. The Patiala Infantry and the Multani Horse on the British side were completely disheartened. But at this juncture, the Guides and the Carabineers came to their rescue and saved the situation. The British artillery was too much for the rebels. But soon the situation took an unexpected turn when Col. Gerrand was mortally wounded by a musket ball. With this, the British too, were demoralized. Taking full advantage of the circumstances, Rao Tula Ram swooped down upon them. The British could not stand the charge and the Multani Horse fled away in bewilderment. They recaptured their guns and inflicted heavy losses on the enemy. The right and the left wings of the British forces were thrown into confusion. Appreciating the gravity of the situation Major Caulfield, the officiating British Commandant, ordered his artillery to start heavy bombardment and his cavalry and infantrymen to charge straight on with full force in to their front ranks. Rao Tula Ram’s forces fought back furiously and stood their grounds. The British artillery fire, nevertheless, broke their backbone and split their forces into two parts – one engaged in the close quarter battle and the other fleeing to go out of the range of the British guns. Rao Tula Ram was defeated that day but managed to flee to safety. His escape frustrated the British. The battle of Narnaul was undoubtedly one of the most decisive battles of the Uprising of 1857. The English felt jubilant over their success in this confrontation, for it marked the “beginning of the end” of the crucial period of the struggle in the Haryana region and northern Rajasthan. After the battle, Rao Tula Ram moved into Rajasthan; then joined Tatya Tope’s forces for one year. On 1 November 1858, the British issued the promise of unconditional pardon and amnesty to all the “mutineers” except those who directly or indirectly took part in the murder of British subjects. Rao Tula Ram knew that with the blood of many British soldiers and subjects on his hands, this did not include him. He left India for Iran in 1862. Once the uprising of 1857 was over, the wrath of the British was unleashed. People in the Rewari and Narnaul areas were hung or shot dead and their villages burnt. In Iran, he plotted revenge against the British. From Iran he travelled to Afghanistan, where tragically, in the winter of 1862, he died of dysentery in Kabul at the young age of 38.